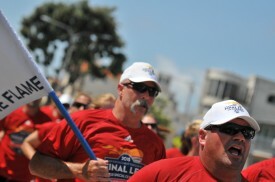 Eric Smith, Chief of Sherman Police Department and Director of the Illinois Law Enforcement Torch Run for Special Olympics, has returned to Illinois after spending two weeks in California running in the LETR’s Final Leg leading to the Special Olympics World Summer Games 2015 in Los Angeles. The Law Enforcement Torch Run® for Special Olympics is Special Olympics’ largest grass-roots fundraiser and public awareness vehicle in the world. The LETR Final Leg for the 2015 World Games, presented by Bank of America, took place from July 13-25. A team of 124 members – including 88 law enforcement officer runners, 10 Special Olympics athletes and logistics personnel – served as Guardians of the Flame as they ran the Flame of Hope throughout the state. 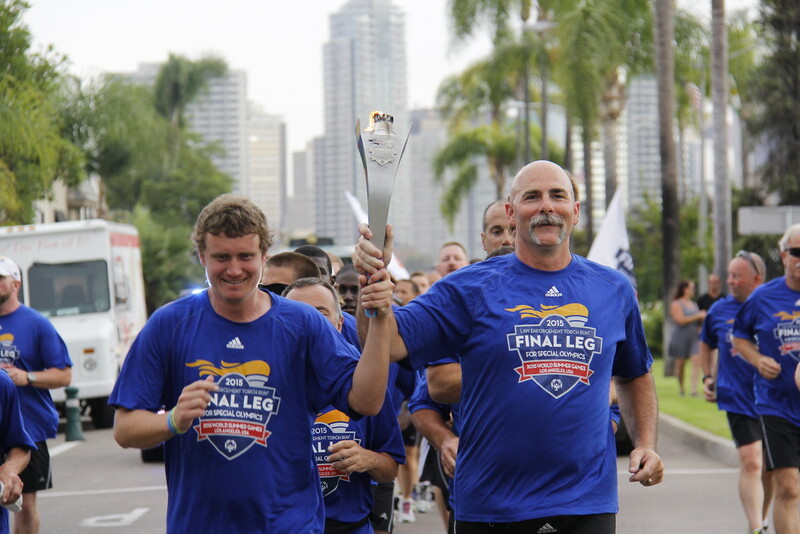 Smith was among the Law Enforcement Torch Runners from around the world who were chosen for their dedication and commitment to the Law Enforcement Torch Run and Special Olympics by their respective Torch Run programs. Special Olympics athletes were selected to be a part of the Final Leg Team based on nominations received from around the world. Smith arrived on July 11 in Los Angeles to meet up with his fellow law enforcement officers and Special Olympics athletes from around the world before heading up to Sacramento on July 12 for the first stop in two weeks of running across the state. 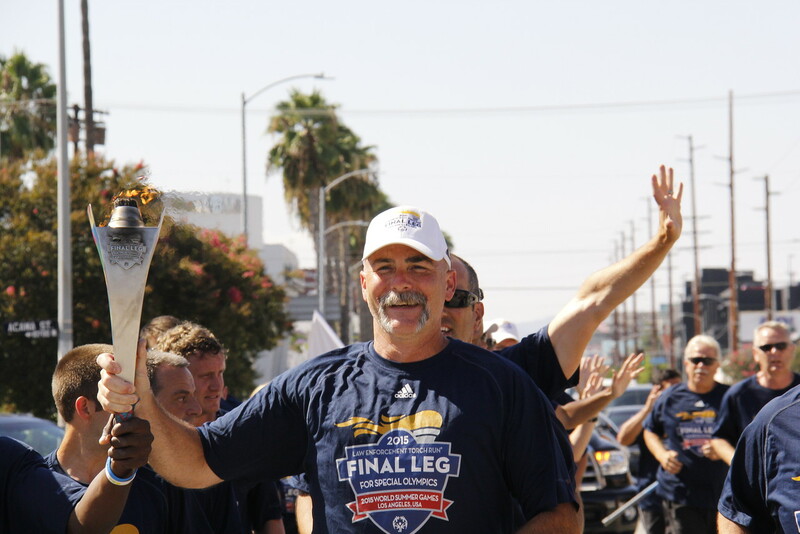 Assigned to Route 1, Smith and his fellow Torch Runners made several stops each day at communities along the route for celebrations to bring attention to the LETR’s efforts to carry the Flame of Hope to the World Games. Smith’s route ran through towns including Sacramento, Lake Tahoe, Napa, San Francisco, Calabasas, San Clemente, Laguna Beach, Long Beach, Van Nuys, Pasadena and Los Angeles. “We traveled from Sacramento up north down to 30 feet from the Mexican border,” said Smith in describing the portions of the state the team covered. 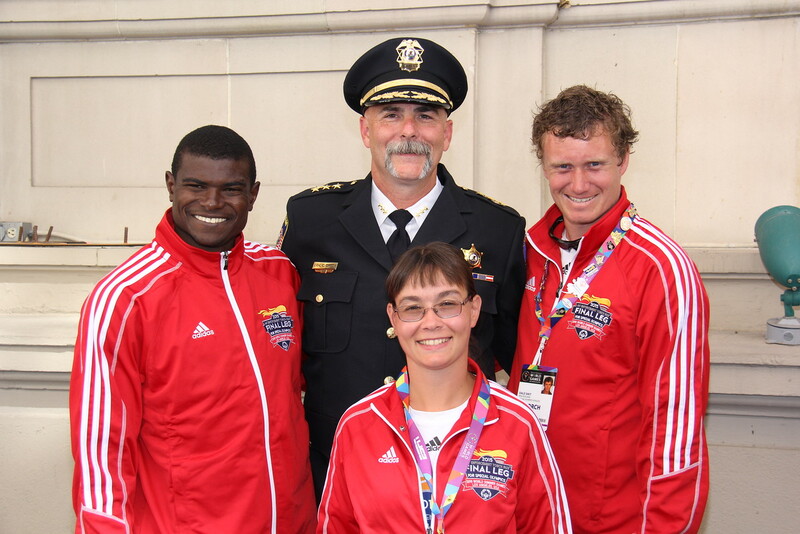 Smith, wearing his dress uniform, is shown with 3 Special Olympics who ran in the Final Leg prior to the Opening Ceremony on July 25. 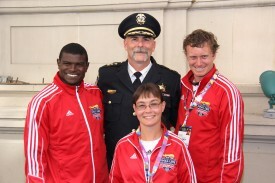 Standouts for Smith were running across the Golden Gate Bridge in San Francisco on July 15 and participating in the Opening Ceremony of the World Games on July 25 wearing his Sherman PD dress uniform. In fact, he was featured briefly on ESPN’s live broadcast of the Ceremony. “My phone kinda blew up after that with texts from people telling me they had seen me on TV,” he said with a chuckle. As the Final Leg ran in the communities closer to LA and delegations started arriving from around the world to their Host Towns, the teams would show up at Final Leg ceremonies. After the ceremonies concluded, Torch Runners would have an opportunity to speak to the athletes. “Seeing the joy and excitement in their faces for what they were about to participate in and for the Torch Runners themselves, made it all come together that we (LETR) are making a difference in these athletes’ and their families’ lives,” Smith said.